Jake Nickell has certainly done alright for himself. Nine years ago, at the tender age of 20 when he was still living in a small apartment in Chicago, he submitted a T-shirt design to an online contest held by a small web design festival in London. He won. Today, he's the founder and CSO of multimillion dollar empire Threadless, the biggest community-centred T-shirt store on the web. It sells more than 100,000 T-shirts per month and Jake's just moved into his new self-designed 5,000 square foot home in Boulder, Colorado. 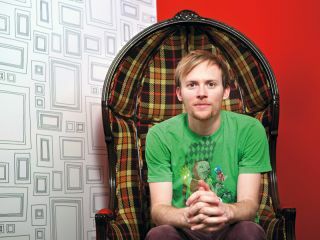 Jake and his friend Jacob DeHart (now no longer involved with the company) started Threadless as a hobby. They invited anyone to submit artworks and had a small but steadily growing community rate the designs. They printed the best ones on T-shirts, with the winning artists receiving cash prizes. Both Jake and Jacob had no business experience whatsoever. In fact, they didn't even know that what they were doing had a name. "We learned that what we were doing was called crowdsourcing about three years into the project," Jake chuckles, "and ended up being the prime example for it. We just started Threadless as a hobby, not to be a business. Not only did we not know the business model was crowdsourcing but we didn't know there was a business model. Today it's the core of our business. It affects every department: the way we market, the way we do our customer service." Before Threadless, Jake had dabbled in web design and development, so he simply applied what he knew and developed the entire fulfilment system from scratch in-house. "Some of the stuff we did was hilarious. We had this scrappy do-it-yourself mentality to getting the orders out of the door. And it worked for quite a while. A lot of the things that we learned, we still have applied today. All the shipping software is still developed in-house." Jake's used a lot of common sense and trial and error to run the business. For the first year, for example, the team charged customers' credit cards over the phone. Inevitably, the lack of business training led to expensive mistakes. "We used to ship our packages via FedEx and had it linked up with our corporate credit card. For every package we shipped they would charge our credit card individually. And since we were only shipping packages once a week, we'd ship 200 to 300 packages in a day and our card would get charged 200 to 300 separate times. What we didn't know: there was a limit on how many charges you could do per day. So FedEx would charge 150 of them and the next 100 would all get declined. Decline fees are $5 for every one, so that all builds up and we'd end up owing FedEx $50,000. And that was when our revenue for the year was just $600,000." In 2006, Threadless reached critical mass. Managing the growth and figuring out how to ship thousands of T-shirt orders in a day turned into the project's biggest challenge. Jake felt like he couldn't do it on his own any more. He considered taking outside investment. "We met Seth Godin in New York because SkinnyCorp [the company behind Threadless] was going to develop Squidoo at some point. Through that we got to know this amazing businessman who helped us craft a deal with Insight Ventures. We had meetings with probably 20 different venture capital firms and a couple of private companies wanted to buy us outright but we decided that Threadless still had tons of potential and we wanted to grow it. We were doing fine moneywise but we were looking for help with the business side of things, and Insight has been really great. We do board meetings every two months, and they help us stay focused and prioritise. They've given us some great advice and continue to come up with excellent ideas."